Yi Mingli, the narrator, who works at a biological research institute in Wuhan, is a sensitive and unassuming character; her husband, editor of a magazine on Chinese traditional medicine, is more rational, slightly boastful and interested in his appearance. A couple like many others with their son and an adopted daughter, the daughter of a childhood friend, Shangguan Ruifang, in a psychiatric hospital for twenty years. The two friends meet regularly in a park where wild grass grows, the “sentinels of wheat”, brought by the father of Yi Mingli who developed wheat hybrids. A book very different from previous novels: a little music, a lot of charm and intelligence. The narrator shows us strength, balance and above all humanity. “Basically women do not ask much, just that they are given some attention. Once a woman realizes that she is neglected, the unwritten contract that links her to the outside world is canceled “(p.41). No pretension, the novelist is not the one to give lessons. “I was born and raised in this city that I both love and hate. The characters in my stories are, most of them, people from Wuhan. I think they represent well the Chinese in general “. Her father was a poor farmer, her mother came from a wealthy family of landowners. “Logically, not from the same environment, they should never have been married … so I grew up in a family at odds with ancient China, so I laid eyes on the world with a fresh look”. She is sent to the countryside as a “young educated” then became a teacher. After three years of study at the Institute of Medicine of the steel industry, she has been in practice for five years. Studies of Chinese literature at Wuhan University allowed her to become an editor in the literary magazine “Fragrant Grass” and then a Vice-President of the Writers Union in Wuhan and then of Hubei Province. ”A Sad Life”, turned down three times, was finally published in 1987 by the Shanghai Literature Review and was rapidly a success. This is her first novel translated into French and published by Actes Sud in 1998. ” A Gap in the Clouds,” the second novel published in France, is a tragic domestic fight of a couple who shows good relations to the outside world and who, in private, is fighting bitterly. Back to their childhood where, without knowing, they met each other in the context of class struggle of the time. The text has been brought to the theater in Paris in 2005 by the director Airy Routier. Despite a very wide audience and continued success, the author hides behind her novels, gives interviews with great reluctance and do not participate in “the literary life.” Upon publication of her latest novels, “So What” which analyzes the relationship between a mother and daughter, some have compared her personal life and characters of the novel, who in order not to disrupt the school success of her daughter, hides her divorce for two years. 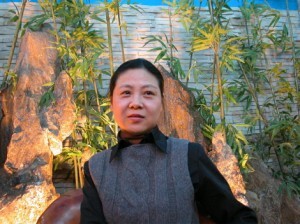 Chi Li has denied in 2003, any parallel between her private life and her novels. Many television adaptations have met success; a film (“Life Show” by director Huo Jianqi), won the Montreal Film Festival in 2002, film form has influenced the structure of her novels. Neo-realism is not the “socialist realism”: The writer does not judge, even if the mention of the difficulties of everyday life is in fact a social critique. The daily worries replace ideology. Politics is there with social control and sometimes by the action of unions, but the Party and the major episodes of political turmoil are absent from her novels. The texts are short (one hundred pages), concise, with few characters; the realistic approach may be harsh but it does not over emphasize misery. “Who do you think you are” (2000) shows us a working class that has lost the position it had under Mao and suffers from unemployment and restructuring. “You’re a River” (2004) describes the life of a large and poor family before the Cultural Revolution. “Not to speak of love” (1989), published in Beijing in 1996, deserves a new edition. The social conflict between intellectuals and poor families is a bit dated; the social pressure when everyone gets involved in the privacy of its neighbors is treated with humor and the machismo of the husband is still relevant! Brevity is not always an asset: “Premeditation” (2002) is one of the few novels “non-urban” which takes place in an environment of peasants and soldiers before the foundation of the People’s Republic. We regret the charm of Shen Congwen in “The little Hunan soldier ” (Albin Michel 1992) or the historical novels by Mo Yan. “Whereabouts” (1999) is set in the world of the nouveaux riches, unfortunately not translated into French, it has been in China a great success, like “The scarf ofTolstoy (2005). So we can expect in the coming years interesting releases . ► Chi Li, “Les Sentinelles des blés,” translated from the Chinese by Angel Pino and Shao Baoqing. Actes Sud. 150p., 15 €.